The scene of the crash on the A9 on Friday. Police are appealing for witnesses to a two-car crash at Dalwhinnie which left a pensioner in hospital with serious injuries. The collision, which involved a red Ford Focus and a silver Toyota Hilux, happened at about 5.30pm on Friday on the A9 Inverness-Perth road. 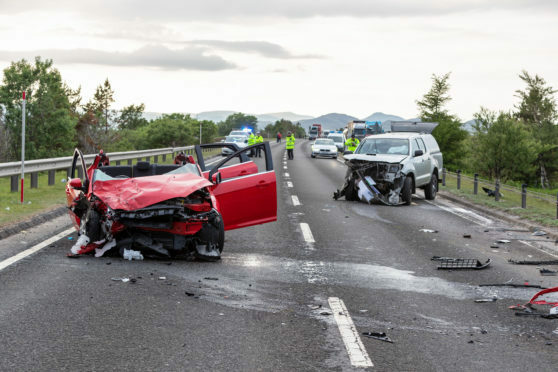 The 72-year-old female driver of the Focus was airlifted to Ninewells Hopsital in Dundee with serious injuries, while her passengers and the driver of the other car were taken by road to Raigmore in Inverness. The road was closed until about 12.30am on Saturday to allow crash scene investigators to carry out their work. Paramedics and police were quickly on the scene of the crash, one mile north of the Dalwhinnie junctions, on Friday evening. Firefighters worked to free the women from the wreckage using hydraulic cutting equipment. Crews from Aviemore, Kingussie and Newtonmore were all sent to the crash site. The front end of the red Ford Focus was left badly crumpled by the collision, as was the front of the Toyota. A large amount of debris could be seen strewn across the road and there was a large fuel spill on the carriageway. Diversions were put in place to allow traffic to keep moving, though there were delays. Anyone with information about the circumstances surrounding Friday’s collision should call police on 101.